In August 1862 Almon W. Gould, the 27 year-old son of Owego Village blacksmith Adam C. Gould (1810-1895) and his wife Rebecca Adeline Arnold (1818-1884), joined Company H of the 109th New York Infantry Volunteers. For nearly the first two years of service, this unit saw little action as they were relegated to guarding the railroads around the Nation’s Capitol. After General Grant took command of the combined federal forces in the spring of 1864, the 109th New York was attached to General Burnside’s independent 9th Corps and moved with the Army of the Potomac into the Wilderness near Chancellorsville, Virginia. According to company records, Corporal Almon W. Gould was wounded on May 5, 1864 — the first day the Federal forces encountered resistance from General Lee’s Army of Virginia. The following letter was written some three weeks later from Baltimore, Maryland where Almon and many other soldiers were convalescing from wounds received during the Battle of the Wilderness. Because it is not Almon’s first letter to his hometown of Owego after arriving in the hospital, it contains no details of his injuries nor an account of the engagement in which he was wounded. It does appear, however, that having seen “the elephant,” Almon was more anxious to return home than to return to his regiment. The letter has been transcribed as written, with only minor corrections to punctuation. It should also be noted that the letter is dated May 1864 and the envelope is dated October 1864. The letter is not completely contained by the envelope so it may be safely presumed that the letter and the envelope were inadvertently mixed by some family member at a later date. 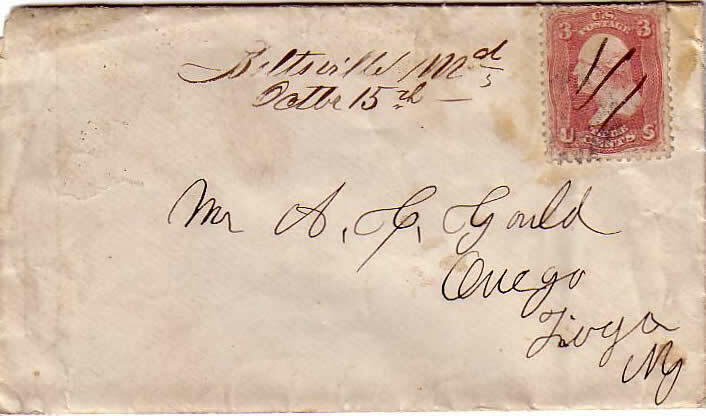 The date on the envelope suggests that Almon Gould was still in Baltimore in October 1864 and had not rejoined his unit which had been engaged in many bloody contests with Lee’s army in what was the last major campaign of the war. Almon’s parents were married about 1834 and lived in Nichols, Tioga County, New York in 1840. By 1850, the couple was living in Owego Village, New York where Adam worked as a blacksmith. They had (at least) the following children: Almon [born 1835], Morris [born 1837], Marion Delray [born 1856], and Fred [born 1861]. Addressed to Mr. A. C. Gould, Owego, Tioga [County] N. Y.
I have just mailed a letter for you all and I thot I would comence a nother and wright when I had a steady hand. this morning is vary warm. I have just ben down to breakfast. it was vary good. The truble is that I am vary weke. I think that I will be all right in a few weeks. I would lik to see you all vary much but all things has its time. I will wait until home, then I will chat with you all a gain for a few moments. May 26. I have changed bunks ¹ this morning. I am suited now. ever thing is so nice. I have got all cleane cloths. I mene under cloths. I am more contented than I was. I don’t worry as much as I did. I think I shall come home but it takes time for all things but do all you can I told you all that was nesary for me. to day I want you to send me all my letter that come direct in Mom’s care. I want all to wright to me that would like to here from me. I received that Paper all in time and it was just what I wanted. Send the next one as soon as they are out. I want some one of you to send me ten postage stamps by the next letter. Don’t fer get one of our number died last knight, shot through the lungs but all the rest that came with me is doing well as can be expected. We have better living than we did. All right now, I want you all to keep up good spirits and hope for the best. You can direct all to me here as I shall stay here if I don’t come home, you may depend up on that. Good by to all at Home. ¹ Regimental records state that Almon was mustered out of the service on 15 May 1865 at West Buildings Hospital, Baltimore, Maryland. Organized at Binghamton and mustered in August 27, 1862. Left State for Annapolis, Md., August 30, 1862. Attached to 8th Army Corps, Middle Department, to October, 1862. 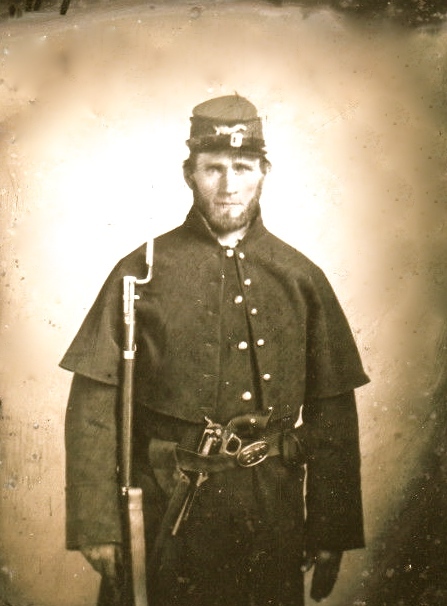 Railroad Guard, 22nd Army Corps, Dept. of Washington, to April, 1864. 1st Brigade, 3rd Division, 9th Army Corps, Army of the Potomac, to September, 1864. 1st Brigade, 1st Division, 9th Army Corps, to June, 1865. SERVICE.-Guard railroad from Annapolis Junction, Md., to Washington, D. C., and garrison duty in the Defenses of Washington till April, 1864. Campaign from the Rapidan to the James May 3-June 15, 1864. Battles of the Wilderness May 5-7; Spottsylvania May 8-12; Spottsylvania Court House May 12-21. Assault on the Salient May 12. North Anna River May 23-26. Ox Ford May 23-24. On line of the Pamunkey May 26-28. Totopotomoy May 28-31. Cold Harbor June 1-12. Bethesda Church June 1-3. Before Petersburg June 16-18. Siege of Petersburg June 16, 1864, to April 2, 1865. Mine Explosion, Petersburg, July 30, 1864. Weldon Railroad August 18-21. Ream’s Station August 25. Poplar Springs Church, Peebles’ Farm, September 29-October 2. Reconnoissance on Vaughan and Squirrel Level Roads October 8. Boydton Plank Road, Hatcher’s Run, October 27-28. Fort Stedman March 25, 1865. Appomattox Campaign March 28-April 9. Assault on and fall of Petersburg April 2. Occupation of Petersburg April 2. Pursuit of Lee April 3-9. Surrender of Lee and his army at Appomattox Court House April 9. Moved to Washington, D. C., April 22-27, and duty there till June. Grand Review May 23. Mustered out June 4, 1865. Veterans and Recruits transferred to 51st New York Infantry. This entry was posted on Monday, June 30th, 2014 at 11:00 pm	and posted in Uncategorized. You can follow any responses to this entry through the RSS 2.0 feed.